RPA has the experience and resources to handle all of your visual system requirements. Our capabilities include design, production, and installation of real image displays (projected or display panel) as well as upgrades to existing collimated systems. RPA principals have combined more than 60 years of experience in training and simulation visual and sensor systems development. We can provide competitive proposals to meet demanding requirements based upon an open market approach to the choice of technologies and suppliers. For more information on how we can help support your visual application, please contact us. 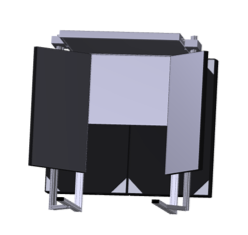 We have the tools to support optical and structural design of any style of display. We have designed, developed, and delivered systems of all types. We can work from customer provided specifications, or provide the expertise to guide you through the process of developing the specifications to meet your application needs. RPA works with many suppliers for each display component and strives to produce and end product that provides the best results for the lowest possible cost. We have in house solutions as well, including our patented, high precision (absolute accurate) display automated alignment system and integrated warp, blend, and color correction software. These products are designed to provide arc-minute alignment accuracy with highly repeatable results. RPA is also partnered with 3D Perception, Inc. to provide seamless integration of our solutions with industry proven software fielded on hundreds of systems worldwide. We have performed upgrades on collimated display systems to include projector replacement (with RPA developed motion compatible mounting structures) and automated alignment of geometry, blending, luminance, and color. 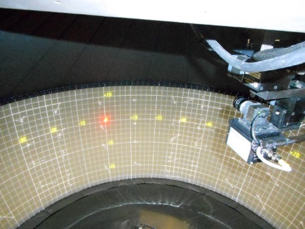 Our alignment systems use physically measured data to ensure precise, repeatable results with each and every operation. If your application is best served by lower cost solutions, we can also support you. We can produce flat screen layouts and structures to meet both visual and mechanical design requirements. We have also developed and demonstrated rear projection systems using consumer grade projectors which use our warp, blend, and color correction software to match the display channels and to drive one image source to many projectors, reducing the number of image source channels required. Whatever your display system needs, RPA can help guide you to the best solution for you requirements. RPA can help you specify, select, purchase, and integrate the best image generator for your application. Our founders were designers of IGs and RADAR simulation systems in their early years in simulation. We have assisted many customers with finding the right IG and sensor simulation systems for the effort. We have also provided hardware upgrades for existing systems where appropriate. RPA’s automated display alignment system was designed with absolute precision in mind. Our patented solution uses measured 3D screen surface maps as the basis for all computations of projection layout and image corrections required to achieve system optical design goals. The result is an alignment solution that can achieve arc-minute geometric accuracy and repeatability with every alignment. The platform is fully integrated with our partner, 3D Perception, control software which allows for operation with RPA software warp, blend, and color correction as well as 3DP hardware solutions. 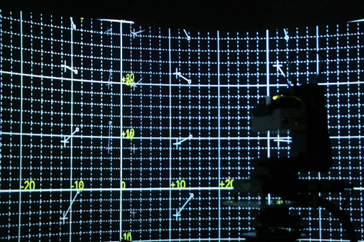 The system has been successfully deployed on both direct projection and collimated systems, providing a geometric measurement based solution for both types of displays. We have also used the system to characterize helmet mounted display systems in special circumstances for several customer studies. We can provide a solution to be integrated into your display, or as a service to perform alignment at any time for systems without an integrated auto-alignment system. Our system has been used many times to solve problems with screen systems that may have localized distortions following installation that are difficult to account for. Our 3D surface map process measures and accounts for such screen variables to ensure rapid, accurate alignment. 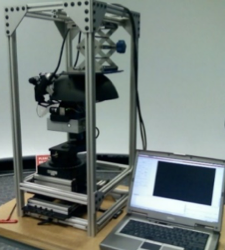 The RPA auto-alignment system was developed under a Navy SBIR, intended to measure and produce absolute accurate alignments for vehicles which also used helmet mounted displays for augmented references to the background scene (HUD symbology, etc.). As such, absolute accuracy was a major design goal as well as adaptation to measurement of HMDs. 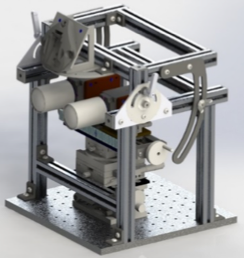 Under a US Navy SBIR, RPA developed an OpenGL application that would work seamlessly with our existing automated alignment hardware and software. 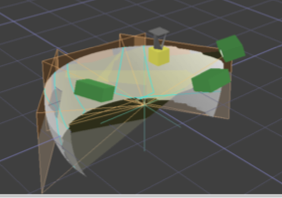 The software becomes a plug in module, inserted in the image generation application post render of the scene. From the rendered scene, it can then perform all of the required functions previously performed only on our available hardware warp, blend, and color correction products. In addition, the software also has the ability to take a single rendered scene and split the imagery to drive multiple display devices, such as an array of low resolution projectors combined to create a single high resolution display image. When combined with our auto-alignment system, our software provides the same high performance alignment capability to achieve absolute precision, arc-minute accurate geometry on a repeatable basis. In conjunction with available color sensors, luminance and color matching between all system channels is also provided. Please refer to our datasheet for more information. RPA has been in the business of providing an alternative genlock solution for gaming style graphics cards since 2004. We have fielded thousands of controllers in a variety of applications. In addition to traditional training visual systems, our genlock solution has also been used in public venues for synchronizing arrays of displays and often a video camera to those arrays. Our latest version of the controller provides a single slot solution with integrated Dual-Link DVI (for support up to WQXGA resolution) on board. This new offering also allows for easy synchronization of dis-similar video formats and synchronization of the graphics cards to external video sources. The controller accepts external signals in many formats, including HD tri-level. As part of a US Army SBIR, RPA developed a secure, untethered training system to support helmet mounted displays and other soldier worn or carried devices. The system uses multiple RF data links, AES encrypted, to provide ultra low latency HD video (< 1 msec), streaming bi-directional audio, and USB replication capability to allow almost any USB enabled device to be used untethered but appear as connected directly to a base computing platform. 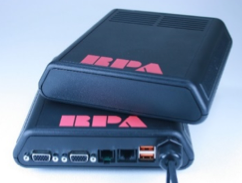 RPA was the first PEO STRI winner of a US Army Commercialization Pilot Program (CPP) award for this SBIR project. 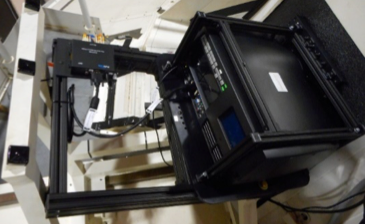 The system can support squad level training in a common space, with each trainee’s scene generation and other host computing platforms to be on stationary platforms, requiring the user to only wear a belt worn transceiver and battery (less than 4.5 lbs.). It can operate through multiple obstructions to at least 10 meter distance. HD video transmission is virtually lossless. RPA has assisted with multiple studies related to helmet mounted display performance. We have produced several fixtures for government labs to allow measurement of scene quality, geometric accuracy, and performance relative to background scenes (both spatial and temporal). 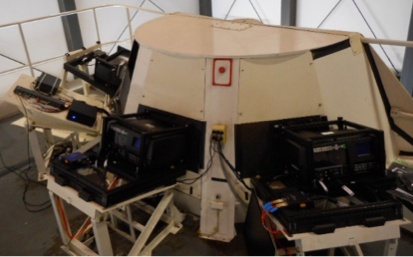 Our automated alignment system was adapted for one Navy study to produce the data necessary to provide dynamic scene distortion correction to ensure correlation of imagery within the HMD to a background scene for a wide range of user motion. A series of pilots were studied with controlled levels of spatial and temporal correlation as variables to determine levels at which the pilots could track and lock onto a moving target using HMD symbology guidance. RPA has the design and fabrication expertise to support unique electro-optic projects such as these. 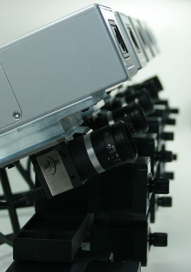 Based upon existing processing platforms, RPA has produced several unique video processing subsystems for our customers. 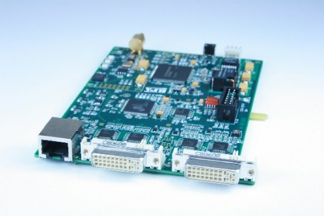 From our broad range of products, we have platforms with standard video interfaces, programmable logic processing arrays, standard control interfaces, and supporting CPU controllers. We can readily tailor a solution to fit a customer’s specific needs, such as to replace legacy processing systems no longer available, or to solve a new problem specific to your system. Past projects have included various forms of video mixing, switching, warping, blending, convolving, and other functions. RPA can tailor a system to meet your particular needs.